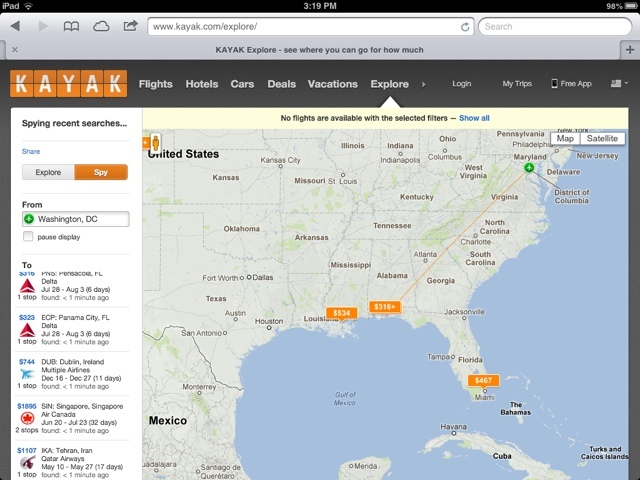 Just noticed this today but the Kayak Explore page now has a "spy" function where you can see a real time stream of all flights booked out of any airport that you select. I am a big fan of Kayak explore as i can quickly look at a map of the world and see if there are any flight deals that catch my attention. With the old version of the software there were occasionally amazing deals that would pop up on the map that I couldn't seem to replicate no matter what i tried. Hopefully with the spy function i can see if people are actually booking flights at that price.